A lot of people know Jack Saddleback. They know he is a Cree man studying sociology. They know he is a two-spirit, transgender gay man. And as of March 26, they know he will be the new University of Saskatchewan Students’ Union (USSU) president. But there is more to Saddleback than that. Saddleback is the third Aboriginal president in a row, following Jared Brown and Max FineDay. "It's important to celebrate these milestones as a campus community," said Saddleback. "I happen to be First Nation and openly transgender, but we are all diverse and unique individuals." "I grew up with a wolf-husky cross named Princess," said Saddleback, who was raised in Samson Cree Nation in Maskwacis, Alberta. "I definitely like dogs more than cats, except The Lion King is my favourite movie." "Not a lot of people know that I met the Queen. I was one of a few people who got the chance to present her with some artwork at a cornerstone-unveiling event at the Canadian Museum of Human Rights." "It took me quite a while to decide. I come from a number of marginalized groups and have faced a series of barriers, both external and internal. 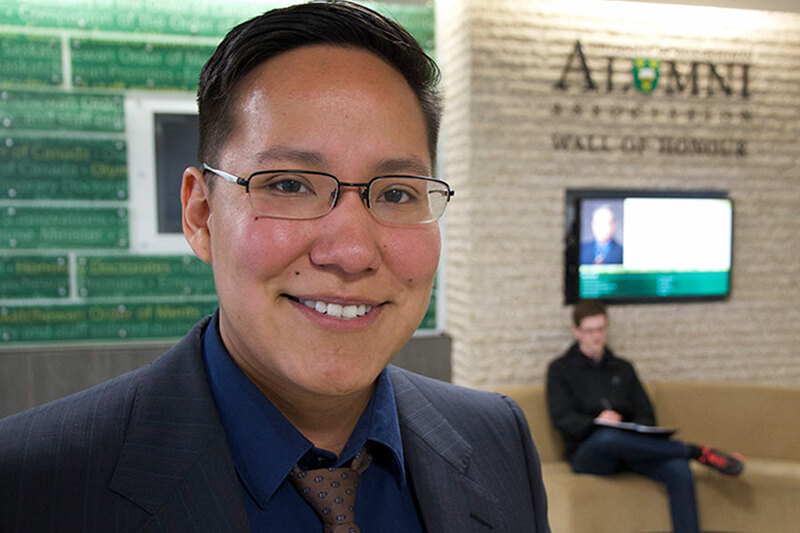 I was afraid and wasn't sure if the campus was ready for a First Nation, two-spirit, transgender president," said Saddleback, who was vice-president of student affairs this past year. In the end he ran, and won. "Everyone has an identity. Mine just happens to be rarer than most. People didn't see me as a First Nation man or a trans man; they saw just a skilled, experienced and passionate individual." Saddleback is putting his passion, experience and skills behind a four-point platform that won him the election with more than 47 per cent of the votes. He stressed the importance of creating a mental health strategy for the campus. "Mental health is a huge passion of mine and through my own experience with depression and suicide, I consider myself an advocate for change." Last year, he was named a Face of Mental Illness with the Canadian Alliance on Mental Illness and Mental Health, and shared his struggles and stories about mental illness across the country. The U of S is one of the last U15 universities without such a strategy. "There are gaps and we need to bridge those gaps so that no one falls through and that means faculty and staff too. Our success as students relies on the well-being of the faculty and staff." Another major issue for Saddleback is creating a sexual assault policy. "This is a huge issue across Canada and we are no different." He wants to create concrete steps that can be followed by those reporting assaults and those receiving the reports. "We need to make it clear what steps will be taken and what the procedure going forward." Saddleback's final two platform planks were about engagement, both with the student body on campus and the broader community off campus. "We need to engage with students at all levels to find out what issues we can address." As for community engagement, he said he wants to make sure students know what funding is available to them to do even more community work. Joining Saddleback on the USSU executive are: Gabe Senecal, vice-president of academic affairs; Kehan Fu, vice-president of student affairs; and Ata Merat, vice-president of operations and finance. "The exec is filled with amazing people with great skills. It's going to be a well-rounded team and I'm really stoked to get started." The USSU president has a seat waiting for him on the U of S Board of Governors and he is looking forward to occupying it. "But the board is like Las Vegas: what happens there, stays there," he said with a laugh. "I don't like corn, but I do like popcorn. Corn on the cob is just not part of my gig, but it's a huge part of my culture."